' Sunshine Sunday: Learn from the Past - Sisters, What! Can I just post this quote and leave it be? But seriously it says it all. How many of you have the tendency to dwell on the past? Go ahead raise your hand (don't worry no one can see you). It always feels good to admit something you have a hard time with. I know I struggle with this, all though much less then I use to. I use to really have a hard time with living in the past, and when I say a really hard time I mean a REALLY hard time. And the sad thing is I missed out on a lot of good times and great adventures because of it. The day I realized it wasn't worth it was the day everything changed. Man the world all around me changed. I couldn't believe the experiences I was missing out on. The day I started taking the past and begin looking for the positive so I could grow I grew leaps and bounds. Now I don't want you thinking I'm perfect at this because boy am I not. But I guess my point is if I can do it anyone can. It isn't easy and it requires some serious mind power but we all can do it. Start one day at a time. Don't be hard on yourself. It isn't going to change over night. But it starts with being positive. Not letting my negative experiences hold me back but letting them spring me forward to a new experience where I'll take what I learned to make it better. For those of you who have mastered this, how did you do it? Share with us because life is better when we help each other. And isn't the purpose of life to live more fully and grow and be better? Here is to living in the present, something my mom has been trying to teach me for some time now, and learning from our past in order to have a more full future. 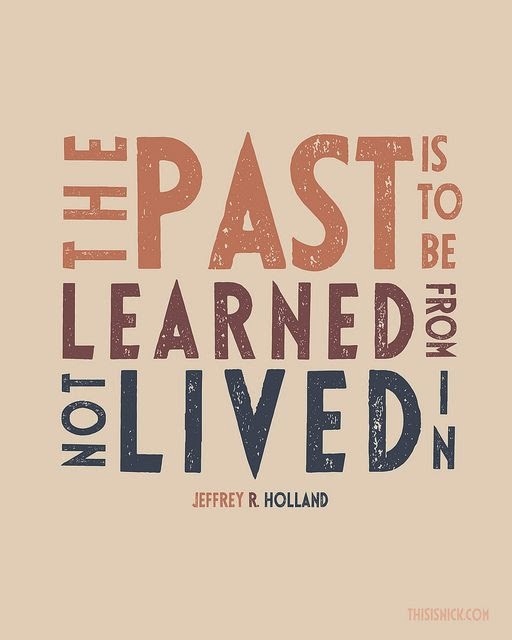 This quote is from Elder Jeffrey R. Holland's talk "The Best Is Yet to Be". Found here.